Feeding frenzy! Lake Toho News Flash! Bass fishing on Lake Toho post hurricane Irma has been unbelievably productive. The hurricane did nothing but help the bass fishing become as active as I’ve seen it in over a decade. The key to this fast action is the high water levels. The state of Florida and the department of engineers are dumping water from one lake to the next. So even though they have the locks wide-open on Lake Toho the water level is staying up higher than we’ve seen in years. East Lake Toho is being dumped into West Lake Toho and West Lake Toho is being dumped into Lake Cypress. Because of this fast moving water at the south end of the lake bass are congregating by the thousands in front of the locks in the moving water. Numbers of catches range between 20 to 50 bass per day for our shiner and artificial trips. Plastic worms have been producing well and free lining Lake Toho’s large golden wild shiners through the current are catching the bigger bass. The canal that leads out of the south end of Lake Toho and flows into the north end of Lake Cypress has the same type of action happening. It seems to be a feeding frenzy. The fish are keyed in on the moving water but the water levels are falling slowly maybe about an inch a day. We’re not sure how long this is going to go on for. Maybe the next 2-3 weeks. If you wanted some place to go where the bass fishing is as hot as you could imagine. Lake Toho is the place to be. 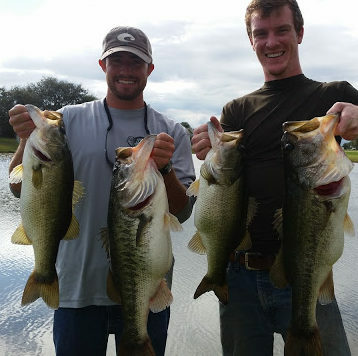 So if you would like to go on one of the fastest bass fishing trips that you could possibly imagine give us a call. We would be honored to take you out on the trophy bass fishing trip of a lifetime. We know where your next trophy lives. We will keep things updated on how this activity continues. Looking forward to fishing with ya’ll. Sounds like tight lines . Great for a belated birthday present. Have one or two other people from work who might want to join in. Would love some info for half and full day trips, total cost, price per person, equipment, jumping off spot , et al.